Pierce potatoes all over with fork. Place potatoes on microwave-safe plate and cook on HIGH 10 to 11 minutes or until tender when pierced with fork. Meanwhile, heat oil in medium nonstick skillet over medium-high heat. Brown ham, stirring occasionally. Remove to small bowl. Add water to skillet and bring to a boil, scraping bottom and side of skillet. Boil 1 minute or until reduced to 2 tablespoons; pour over ham. Split potatoes almost in half; fluff with fork. Top evenly with ham mixture, sour cream, onions and Cheddar cheese. 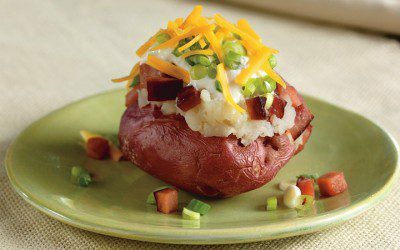 Note: Red potatoes are good for boiling and mashing because of their low starch and high moisture content. Yukon Gold potatoes have a rich, moist texture that is also ideal for mashing. Exchanges per serving: 3 Bread/Starch, 1 Fat, 1 Meat.